When I was a young whelp, back when my writing career involved pictures of dragons and a black-and-white spiral notebook, I spent a lot of time playing the first Final Fantasy. It was one of the toughest games I owned, and I loved it not just because it was pretty, and engrossing, and creative, but because it forced me to think about how to use the resources that were at my disposal. Looking back almost 26 years later, what's interesting about the original Final Fantasy is that it's nothing like any of the others. Future Final Fantasys would emphasize storytelling over dungeon-diving, party narrative over party management. Even the second and third games, while challenging, were less about managing resources and more about figuring out which spell to spam against each boss. But not to worry. If you miss that old-fashioned dungeon crawling, there's a brand new option that might be as close to Final Fantasy as you can get today: Etrian Odyssey. 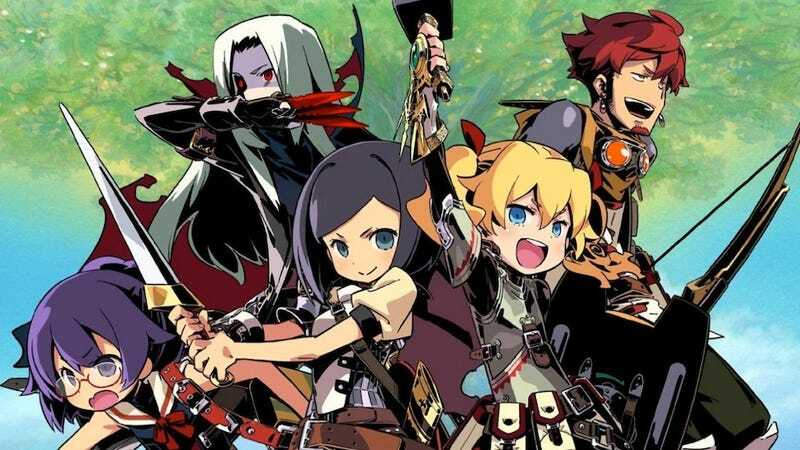 Over the past week I've spent a great deal of time with the fourth Etrian Odyssey, which came out on Tuesday for 3DS, and while it's safer to compare it to first-person RPGs like Wizardry and Might & Magic, it keeps taking me back to Final Fantasy. Let's look at the two. Final Fantasy starts off by asking you to make a party of four people, each of whom can pick one of six classes. There's a rudimentary story—"go save the princess! "—and your cash reserves start off very low. Although you'll get more money as you go on, equipment just keeps getting more and more expensive. Spells and items are always limited, and it's very tough to revive your characters once they die. You have to be smart and conservative in order to survive each dungeon. Etrian Odyssey IV starts off by asking you to make a party of five people, each of whom can pick one of seven classes (at first). There's a rudimentary story—"go find the magic tree! "—and your cash reserves start off very low. Although you'll get more money as you go on, equipment just keeps getting more and more expensive. Spells and items are always limited, and it's very tough to revive your characters once they die. You have to be smart and conservative in order to survive each dungeon. 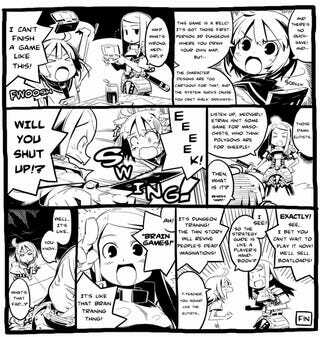 Atlus made this great comic to sell the first Etrian Odyssey. Click to expand. When I first played Final Fantasy, I'd spend hours drawing maps in a large graphing notebook. When I play Etrian Odyssey IV, I spend hours drawing maps on the 3DS's bottom screen. Things haven't changed. But I don't love Etrian Odyssey IV because of some sort of whimsical longing for my childhood days with Final Fantasy. What I enjoy about Etrian Odyssey IV—and other dungeon-crawlers of this nature—is that it gives me a set of tools and makes me use them to solve problems accordingly. Two sets of tools, really. Mapmaking tools, which help you solve the problem of "where the hell am I? ", and character-honing tools, which help you solve the problem of "how the hell do I get through the dungeon without being killed?" The first set of tools is represented by lines and icons on your bottom screen. The second set of tools is represented by the items and skills used by each of your characters. See, to master Etrian Odyssey IV is to make a series of intelligent choices. You have to decide how to best balance your party's offense and defense. You have to choose whether to spend money on powerful new weapons or essential restorative items. You have to figure out whether it's wiser to warp back to town and save once you beat the mini-boss on level two or keep plowing through so you don't have to go through the whole dungeon all over again. It's also about mastering systems. Figuring out which of your skills do the most damage. Figuring out how much healing you really need to do in between each battle. Figuring out how to survive through very difficult circumstances. I play JRPGs for essentially the same reasons my uncle tinkers with cars in his garage. It's not about where you drive the car; it's about making that motor purr the way you want. The more a game exposes its systems to me, the more possibilities I see to fully invest myself in that experience. Many of these systems could be simplified or automated, but I often don't want that. I like to lift the hood and work on the motor myself. I want to drive my own way and feel the engine propelling me. This is what the best JRPGs do. They let us feel the power and responsiveness of their systems, and they give us fun-to-use tools to access those systems. That's the key to understanding the appeal of Etrian Odyssey. That's why it feels so much like the original Final Fantasy. The fun part of these games isn't hitting A as you cycle through menus. It's tinkering with systems, opening them up, seeing if your decisions are smart enough to get you through the obstacles in front of you. It's giving names to your silent characters and dreaming up their backstories as they work together to adventure through dungeons and battlegrounds. It's about remembering that the boss is going to counter all of your attacks every fifth turn. It's about saving your best spells to disrupt him before he can execute his most powerful attack. It's about realizing that it's not such a good idea to progress to the next land before heading back to town and saving your progress. It's about figuring out the systems—and then beating them.